With warmer temps finally signaling springtime, it’s the perfect time to get your outdoor spaces ready. A comfortable chair will add welcoming functionality to a small balcony or front porch, while a lounger will create a relaxing retreat on a deck or in a garden. View more outdoor furniture here, and complementary outdoor living accessories here. 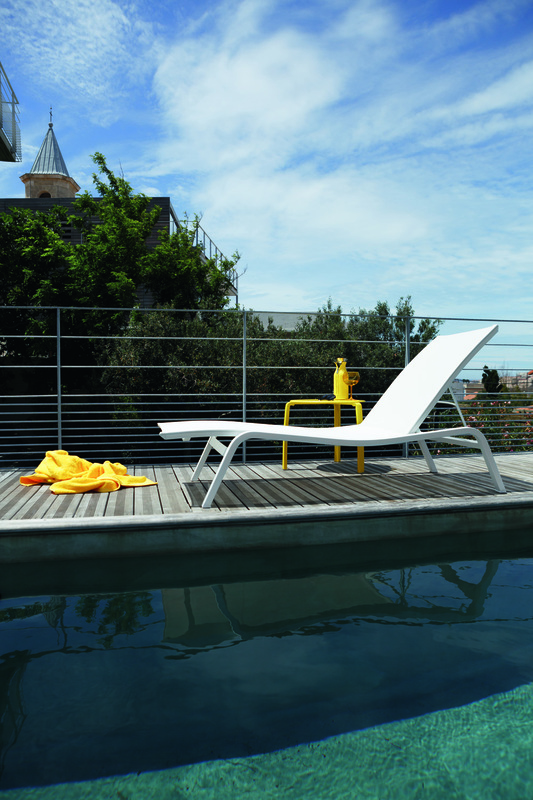 The Alizé Sunlounger XS from Fermob combines a traditional design with functional advances. The fabric of the lounger is an outdoor technical fabric, making it extremely durable and resistant to weather damage. The canvas is also comfortable to the touch, so the Alizé can be used without a cushion or covering. The gently curved frame and bed add a sense of lightness to the Alizé, making this design from Fermob a refreshing option for outdoor spaces. The Deneb Diamond Kite from Haptic Lab is the ideal companion to a lazy afternoon in the park. The boldly patterned kite features fabrics that are screen-printed by hand in Brooklyn, and later cut and assembled in Williamsport, PA. Due to the handmade nature of the kites, each Deneb is slightly different from the next, making it a one-of-a-kind piece. The kite includes Haptic Lab’s signature ten-foot-long patchwork kite tail, and also includes basic kite twine and flying instructions. From Danish company Skargaarden, the Häringe Lounge Armchair is crafted in teak and features a black powder-coated steel frame and natural grey cushions. Covered in a durable sunbrella fabric, the cushions are designed for use outdoors, making the armchair an excellent choice for a patio or deck. The chair can be oiled once a year to retain the rich teak color, or left alone to develop a silvery grey patina over time. Crafted from olde growth pine salvaged from antique flooring from a 19th century home, the Reclaimed Wood Tree Swing from Peg and Awl adds a vintage, charming look to a backyard or garden, and works best when hung from a large tree branch. The thick slab of wood is finished with hand-rubbed natural tung oil, which makes the seat water resistant and durable. Celebrated architect Frank Gehry designed an innovative furniture collection for Heller in 2004. The collection, including this easy chair, is characterized by its striking resemblance to sculpture. Although the pieces are suited for daily use, they also look quite lovely on their own—the sleek surfaces, coupled with the gentle curves and flowing lines, allow the collection to be admired for its beauty, as much as it is utilized for function. A part of Loll’s accessories collection, this Garden Tote is designed with clean lines and an easy to grab handle. It can be used—as the name suggests—to tote things around, but also can be used as a planter. Made of a durable, washable, and recycled material, this tote is easy to clean and does not rust. It is available in several colors, from saturated hues to neutrals. With its intricate Farmhouse Lounger, Bend Design sought to design a piece that was as sturdy as a piece of farm machinery, but equally easy to relax in after a long day. The backrest was inspired by old Amish barn architecture, which is then blended with modern geometric shapes. The chair can be used indoors and out, and is comfortable enough to use without a cushion. Designed by Massimo and Lella Vignelli for Heller in 1964, their melamine tabletop collection is characterized by clean lines and a simple, classic aesthetic. Each piece’s precise shape enables it to be stacked easily with other pieces, making the Vignelli line a welcome addition to confined cupboards. This set of six 302 mugs presents the classic, no-frills design in a rainbow of colors.